Yes, totally it feels like the movie Boyhood, which follows the life Mason played by Ellar Coltrane. Good movie by Richard Linklater filmed over 12 years with the same cast. So when I first tasted the first 10 year old Finnish single malt whisky, it was kinda like I had been there all those years. Been through the 3 and 8 year olds along with the first special edition whisky by first commercial whisky producer from Finland. As a Finn, I might be bias. 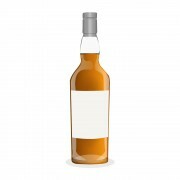 But I love this whisky matured in a combo of bourbon and sherry casks. I first started with a 1 cl sample near the launching date of 10th of October, but got my own bottle just before Christmas 2015. This is a big step up from their 8yo. Nose: Creamy with toffee, strong malt and little bit of vanilla. Salty licorice and fruit candy grains come with oxidation. Like the salmiac version of fruit candy grains. Taste: Salt and pepper with licorice, oak and spicy notes. Bit sweet with sugary notes buried in the back. Oxidation brings some fruit candy feel. The same kind of candy as with aromas. Salmiac is again, very much present, almost like Highland Park 18yo. Finish: Medium length with spices, oak and bit of oil. Some salmiac is present again, and again, resembling HP18. Both drams have got the same quality of getting better while resting in opened bottle. Balance: Major step up from the 3 and 8 yo single malts by Teerenpeli. Has some same qualities, but everything is much better, deeper aromas and taste. @Rantavahti, thanks very much for a very interesting review. Certainly any whisky which tastes a lot like Highland Park 18 yo is a good whisky for the world to have! I hope that I some day get a taste of these Finnish delicacies. Thanks @Victor, hopefully you'll get a chance. At the moment the availability makes them hard to get and the prices are high. Teerenpeli increased its capacity so I hope it will make the current situation better.